This “Justine” dining table set is crafted from high-quality, sustainable lumber by Amish craftsmen. Styles are both traditional and contemporary. It’s too often said that, “They don’t build it like they used to.” But when it comes to durable, high-quality home furniture, a few craftsmen still follow the old-fashioned ways. Amish craftsmen around the Midwest still employ time-tested traditions when building an impressive array of handmade furniture. At Simply Amish, 2684 Sandhutton Ave., Rockford, every bedroom set, bureau, table, entertainment center, bookcase and chair is made to order by Amish craftsmen. Like the furniture of our grandparents, these are heirloom-quality items are built to last. The quality difference is obvious. Reisenbigler points to a kitchen hutch as an example. He pulls out a drawer and shows off the inside. Full drawer boxes, with a separate piece for the face; dovetail construction; smooth drawer bottom; drawer glides with an under-mounted soft-cushion close. Then, he moves to the back of the hutch. No flimsy cardboard or laminates here. Solid panels of wood are screwed in for extra support. He gives the hutch a light slam with his shoulder, to show its sturdiness. It used to be that Amish furniture came in just a few traditional styles, such as Arts & Crafts, with its straight lines and grainy wood patterns, or Shaker style, with its traditional simplicity. Now, more contemporary looks also are among the 40-some styles presented in a catalog. Yes, this furniture is more costly than its big-box counterparts, but you get what you pay for, says Reisenbigler. The options are completely customizable. Customers can choose from oaks, maples, cherries and hickories, stained to a variety of colors. Table legs come in many styles, as do knobs, tabletops and tabletop corners. As a starting point, though, some styles fit naturally with a certain kind of stain or wood grain. For example, the fine, grain pattern of quarter-sawn oak fits especially well with the Frank Lloyd Wright-era Arts & Crafts style. Oak is by far the most popular choice, because of its durability and tendency to show rich wood grain. Cherry is also popular for its rich grain patterns, in both dark and light stains. The softer maples, on the other hand, show a light, minimal grain that’s increasingly popular. For an especially unusual look, Reisenbigler suggests the “character cherry,” a darkly stained, beautifully grainy, limited-edition run of furniture that puts knotty boards to use with stunning results. Choosing the appropriate wood may also depend upon the wear and tear a surface is likely to take. Maple, for example, may be less durable than oak for the kitchen tabletop of a busy family. The Amish live simple lives, devoid of many modern technologies, as part of their religious belief. They avoid electricity, wear simple clothing, and encourage humility and calmness, while discouraging arrogance. Many Amish communities flourish in rural areas across the Midwest and Northeast; the horse and buggy is still their main form of transportation. Most of the furniture that Reisenbigler sells is made by about 60 Amish families across central Illinois, Indiana, Ohio and Missouri. Because all of these shops are part of the Simply Amish national brand, they work with the same designs, standards and stains, yet produce different wares. One family may specialize in bedroom sets, while another specializes in kitchen tables and chairs. The Amish shops today are surprisingly modern facilities, for a group that doesn’t use electricity. Each piece of furniture is built one part at a time, using modern, hydraulic-powered equipment, powered by air compressors and a diesel generator outside. Men and women, many of whom are related, work together completing specific tasks. When the stain is dried, the piece is sanded, varnished a few times and inspected. Over the 20 years that Reisenbigler has sold Amish furniture, he’s grown pretty close with the Millers and several other Amish families. Because of the cultural differences, it’s been a learning experience for both producer and customer. “The Amish families pretty much keep to themselves,” says Reisenbigler. Back in 1993, when he opened the store, Reisenbigler was mystified by the craftsmen’s seemingly unfriendly attitude. Kevin Kauffman, one of the founders of Simply Amish, offered some advice on how to relate. After 20 years of building relationships with these families, Reisenbigler finds they’re much friendlier now. Occasionally, the Amish visit his Rockford store and meet with customers. In return, one builder recently invited Reisenbigler to an Amish wedding. Amish furniture is built to be durable, but that doesn’t mean it’s indestructible. When the drawers get sticky or gaps and cracks emerge, humidity has been at work. 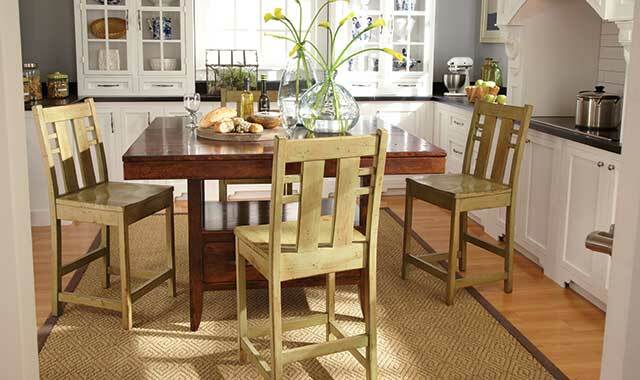 Simply Amish furniture is built from kiln-dried wood, which helps to guard against moisture damage. Even so, some simple habits can keep it in good shape. Always wipe away condensation and spills, using warm water and a little soap – harsh chemicals can hurt the varnish and void the warranty. Placemats and trivets protect the wood from heat and dishes, but if a table is exposed to lots of sunlight, it may begin to fade. Expect this furniture to take some wear and tear, Reisenbigler says, but because it’s all-natural, it’s easily repaired. Every piece is designed to meet California’s strict emissions standards for formaldehyde, a chemical used to preserve lumber. The few veneer products at Simply Amish contain a low-formaldehyde glue, and are covered with a layer of real wood. Sustainable living has always been part of Amish life, where fossil fuels and electricity have limited use. Neighbors swap wood scraps and use them for heating; some recycle sawdust into livestock bedding. The Simply Amish company now uses water-based stains, which use fewer volatile chemicals than oil-based stains. And the company maintains that nearly 70 percent of its furniture is made within 20 miles of its distribution center. Goodbye, packaging! Not everybody makes things the way they used to, but thanks to that Amish simplicity, high-quality, handmade furniture is still available. This entry was posted on Monday, July 1st, 2013 at 11:59 am	and is filed under Home & Garden. You can follow any responses to this entry through the RSS 2.0 feed. Both comments and pings are currently closed.